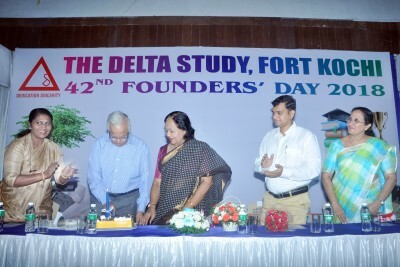 The 42nd Founders' Day Celebration was commemorated on 12th July, 2018 at St. Andrews Hall, Fort Kochi. The Chief Guest of the day was Mr. A.I Kurian, President of the Delta Schools Society. The Principal, Mrs Shireen Francis welcomed the gathering. The Chief Guest delivered the Key note address and released the school magazine, "Harmony". The Guest of Honour, Mrs.Sarah Kurian gave away the prizes to students for the achievements in various fields. PTA President Mr.Cypriyan Antony offered felicitation. A PPT on the history of the school was presented. The entertainment programme included a song by the School Choir and a dance number .